Les Druiven of Hamilton, Ontario rests while waiting for wind to begin racing in the 2018 DN North American Championship Regatta on Lake Charlevoix on Thursday. "Even the good boats can't go in this wind, it gives me a little bit of comfort," said Druiven, who said he has sailed ice boats for decades but is entering a race for the first time with this regatta. 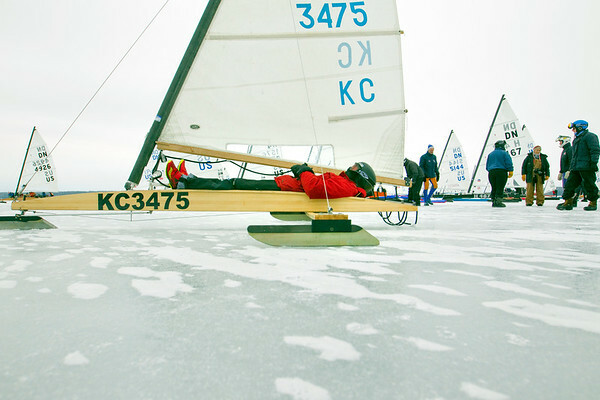 The regatta, which has about 90 boats from 7 countries, chose Lake Charlevoix from possible sites from Maine to Minnesota because of its current ice cover and probably weather conditions. Racing continues Friday, weather permitting.